SpaceX successfully launched the fifth set of 10 Iridium NEXT satellites into orbit from Vandenberg Air Force Base in California on March 30 at 7:13 a.m. The 10 new satellites successfully communicated with the Iridium Satellite Network Operations Center and are now engaged in the testing process. Shortly before launch, the Iridium network met a major milestone as it surpassed one million active subscribers. This continues a trend of significant growth for the Iridium network. 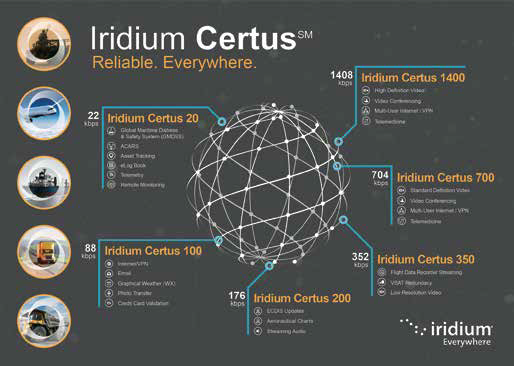 Paving the way for Iridium’s growth is the Internet of Things (IoT), where Iridium has established itself as the satellite network of choice to keep “things” connected beyond the limits of cellular coverage. More than half of the subscribers on the Iridium network are IoT devices, delivering a wide variety of solutions by hundreds of licensed technology partners. These devices are designed to do everything from tracking endangered species and monitoring power lines to controlling shipping container temperature levels or serving as tsunami warning systems. Further positioning the company for success is the Iridium NEXT satellite constellation, which is now well more than half way completed. To date, Iridium has completed five launches of 10 Iridium NEXT satellites, all with SpaceX from Vandenberg Air Force Base in California. A total of eight Iridium NEXT launches are currently planned with SpaceX delivering a total of 75 new satellites to orbit. In total, 81 satellites are being built, with 66 in the operational constellation, nine serving as on orbit spares and six as ground spares. The first stage booster for this launch was previously flown during Iridium-3 in October 2017, making this the second Iridium NEXT launch to use a flight-proven Falcon 9 rocket. Each launch strategically delivers new satellites to specific orbital planes to ensure the earliest possible completion of the constellation. The Iridium network is comprised of six polar orbiting planes, each containing 11 operational, crosslinked satellites, for a total of 66 in the active constellation. The 10 Iridium NEXT satellites launched were successfully delivered to orbital plane one, where they will replace first generation satellites over the next 30 days. 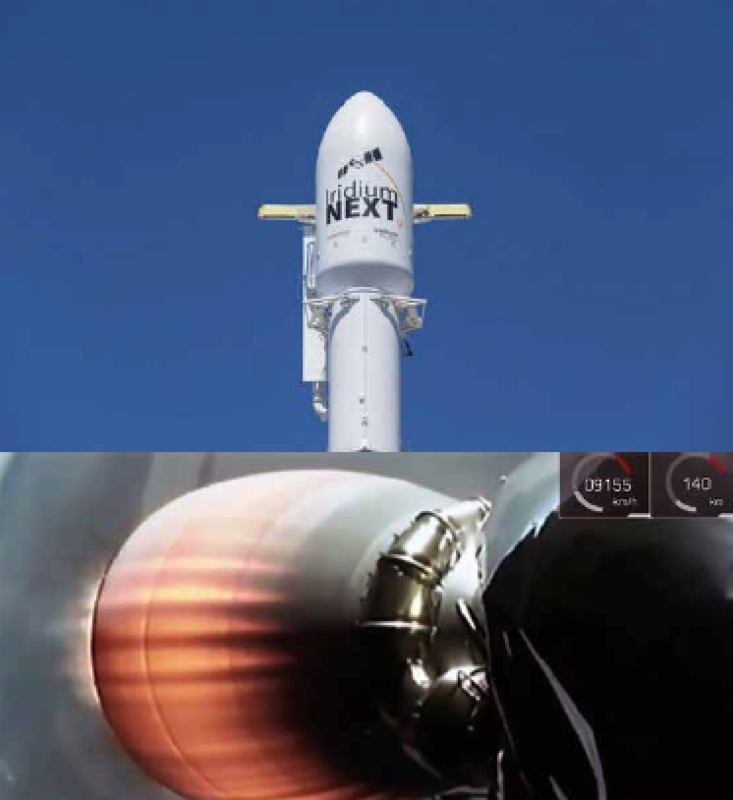 The SpaceX Merlin rocket engine pushing the Falcon-9’s Iridium NEXT payload to orbit. Image is courtesy of SpaceX. Iridium NEXT will replace the company’s existing global constellation in one of the largest technology upgrades ever completed in space. It represents the evolution of critical communications infrastructure that governments and organizations worldwide rely on to drive business, enable connectivity, empower disaster relief efforts and more. “It’s a unique coincidence that we passed the one million subscribers mark right at this launch, and it’s particularly exciting because we’ve surpassed this milestone earlier than we had anticipated,” said Matt Desch, chief executive officer at Iridium. ICEYE will be cooperating with the European Space Agency (ESA) to mutually explore opportunities provided by ICEYE’s technology. By using ICEYE’s SAR satellite technology and imagery, this new agreement demonstrates ESA’s interest in taking advantage of recent innovative New Space developments to foster business. The cooperation encompasses activities that focus the design of the ICEYE microsatellite and its X-band SAR instrument, as well as identifying the most promising applications for the data collected by such a smallsat constellation. By empowering ESA with ICEYE data, the constellation is helping to shape the future of observing our planet from space. Data collected by ICEYE benefits both researchers and a wide range of commercial industries. Challenging issues such as natural disaster response and climate change research, oil spill and illegal fishing detection all require repeated and timely imaging, regardless of the weather conditions or time of day. 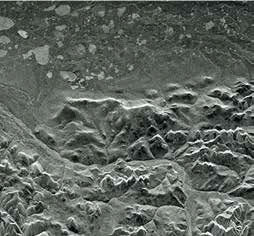 This shared effort to gain vast SAR imaging capabilities from new technological developments impacts the whole Earth Observation (EO) industry and its end users. ICEYE also recently announced collaborations with two other European entities, Kongsberg Satellite Service (KSAT) and Aker Arctic, to collect and provide SAR data for maritime and ice monitoring. 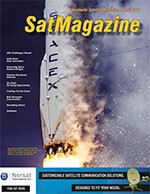 ICEYE remains on track to launch its next two SAR-enabled satellites, ICEYE-X2 and ICEYE-X3, later this year. Winning numerous awards for their products validates the success that this company enjoys for their powerful second generation GaN technology. Advantech Wireless’ Ku-Band 3200W Hub-mount SSPA/SSPB/BUC UltraLinear™ SapphireBlu™series GaN Technology was awarded Teleport Technology of the year 2014 by the World Teleport Association and Most Innovative Product of the Year 2013 for its ground breaking performance and pioneering technology. Advantech Wireless’ SapphireBlu™ Series of UltraLinear™ GaN based High Power Amplifiers and BUCs is the solution for wide bandwidth, ultra high power satellite teleport uplinks. 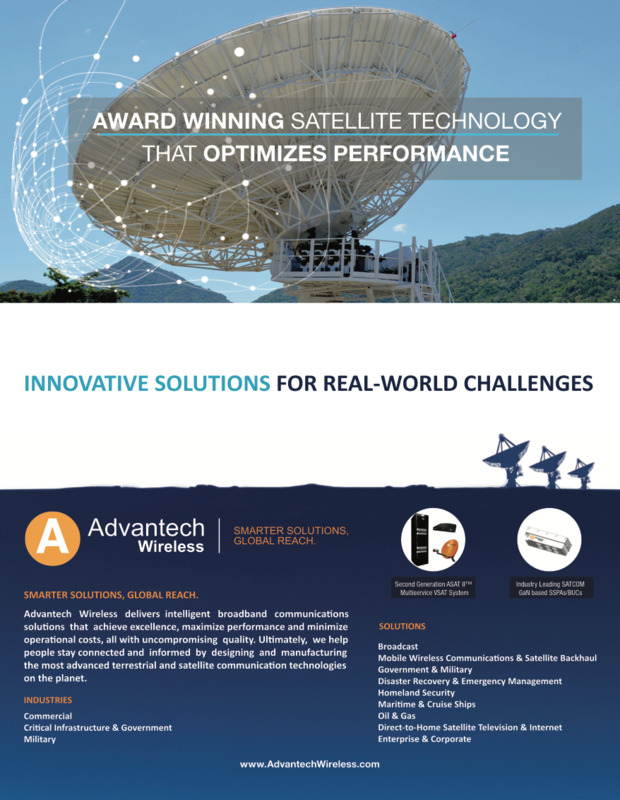 Advantech’s development revealed that saturating all transponders of an entire satellite enables one to obtain the maximum power/bandwidth combination necessary. This will translate into energy consumption savings in energy cost, satellite bandwidth and CAPEX. The GSLV-F08 launch, carrying the GSAT-6A satellite. Photo is courtesy of ANI. into orbit. The rocket, carrying the country’s communications satellite GSAT-6A, lifted off from the spaceport here today. The GSLV-F08 rocket and the passenger satellite blasted off at 4:56 p.m. from the second launch pad at India’s Sriharikota launch site. The 49.1 meter tall GSLV carried the 2,140 kg. GSAT-6A satellite to a geostationary orbit at a height of about 36,000 km. According to ISRO, two improvements — induction of high thrust Vikas engine and an electromechanical actuation system — have been incorporated into the rocket’s second stage for this launch. 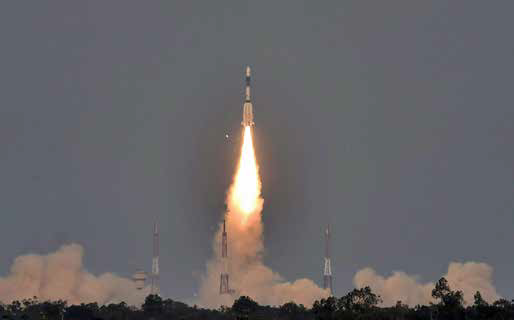 The ISRO stated that the GSAT-6A was similar to the GSAT-6 and will provide a platform for developing technologies, such as demonstration of 6 meter, S-band, unfurlable antenna, handheld ground terminals and network management techniques. 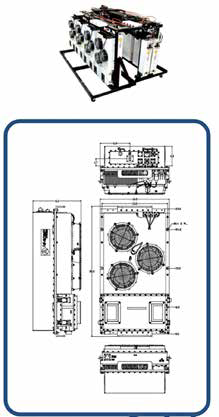 These are useful for satellite-based mobile communication applications. ISRO Chairman K.Sivan indicated that the GSAT-6A would be followed by the launch of navigation satellite within the next fiscal year. What started out as an experiment with an African smallsat launched from the International Space Station has proven so successful that some of the satellite’s subsystems have created their own market and have generated international sales for a niche market. The fully completed nSight1 satellite which has been orbiting Earth for almost a year. The satellite — called nSight-1— is a product of the Somerset West-based SCS Aerospace Group (SCSAG), Africa’s largest privately-owned group of satellite design and manufacturing companies with more than 25 years of experience in this domain. The satellite was launched from the International Space Station in May of last year with 28 other satellites as part of the European Space Agency’s QB50 project, which collects research data from the Earth’s lower thermosphere. Francois Denner, Managing Director of the SCS Aerospace Group, said that they are delighted and extremely proud of the performance of their satellite nSight-1. 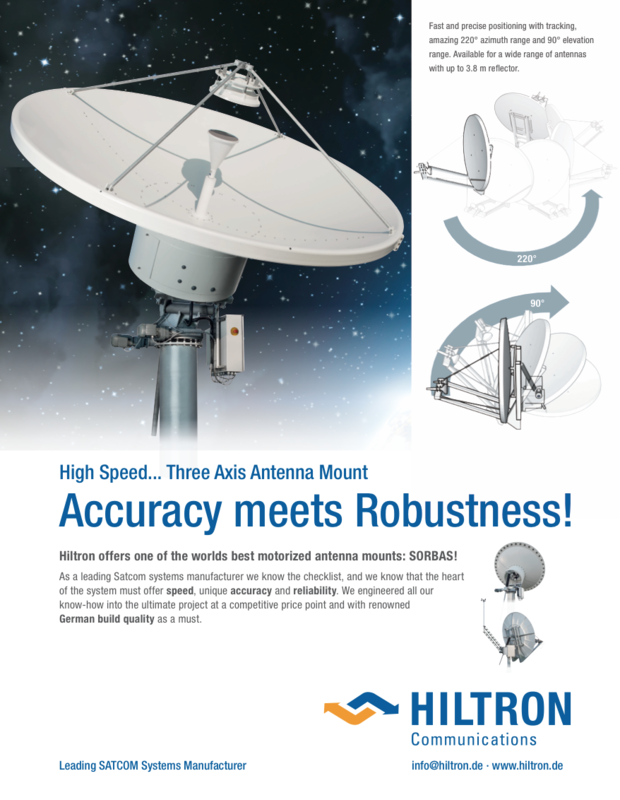 The satellite is in a stable and healthy state and the various on-board payloads are working well and have resulted in a number of major sub-systems sales to international clients. Denver continued by saying that the success of nSight-1 certainly strengthens the company’s position to play a leading role in forging a new satellite business cluster in the South African economic sector. Their group now has the ability to manufacture as many as 80 percent of the needed small satellite components locally — and they are proudly South African. The three companies in the SCS Aerospace Group which are directly involved in providing commercial satellite solutions are Space Advisory Company (SAC) their satellite program and systems consulting and engineering house; SCS Space which provides satellite mission solutions as well as satellite systems; and NewSpace Systems, which develops and manufactures high-quality space components and sub-systems. The group employs some 90 highly trained satellite specialists such as electronic, systems, software and mechanical engineers. According to Hendrik Burger, CEO for SCS Space, the primary contractor for the nSight-1 nanosatellite, the Attitude Determination and Control System (ADCS) used on board is one of the most advancedto be used in a satellite this size. 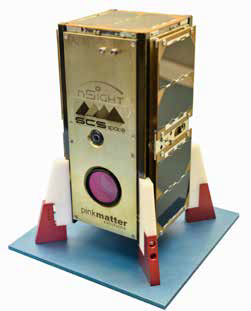 This is another South African product designed and manufactured by CubeSpace and has given the satellite a high degree of pointing accuracy in orbit some 400 km. above Earth. The company is now looking at extending the orbit lifetime of the satellite from 18 to 24 months due to its low drag, specific mass and orientation control. • The Grabouw-based ground station that controls the satellite is autonomously operating and will in the future form part of an international network of satellite ground stations servicing the evergrowing need by LEO satellites. Denner concluded that the nSight-1 mission demonstrates the ability of the SCSAG to leverage the capabilities in the South African space industry cluster, and he thanked all the South African project partners including SCS Space, Space Advisory Company, NewSpace Systems, Pinkmatter Solutions, the Department of Trade and Industry, Stellenbosch University, CubeSpace, Denel Spaceteq, DeltaV Aerospace, Simera Technology Group, Cape Peninsula University of Technology, Nelson Mandela Metropolitan University and the Amateur Radio Society, who made this project possible.